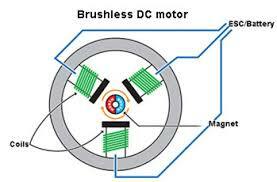 Brusheless DC motor s were invented in the 19th century and are well-known. BLDC motors were made achievable by the growth of solid state electronics in the 1960s. BLDC motor (BLDC motors, BL motors) also called as electronically commutated motors (ECMs, EC motors), or synchronous DC motors, The structure of a brushless motor system is typically analogous to a permanent magnet synchronous motor (PMSM), but can also be a switched reluctance motor, or an induction (asynchronous) motor. The advantages of a BLDC motor over brushed motors are high power to weight ratio, high speed, and electronic control. BLDC motors discover applications in such places as computer peripherals (disk drives, printers), hand-held power tools, and vehicles with ranges from model aircraft to automobiles.